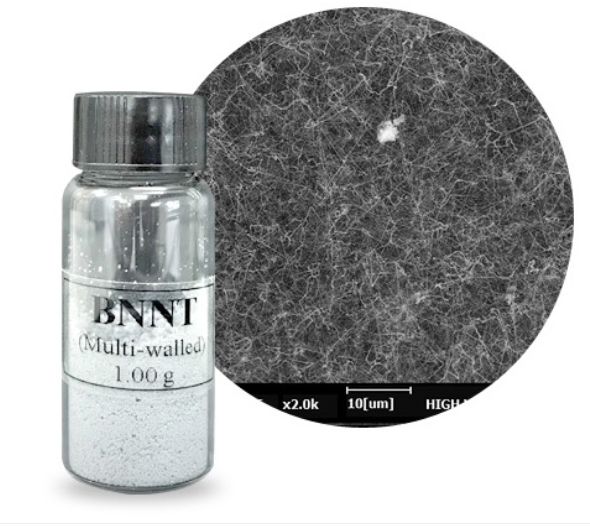 BNNT presents similar thermal conducting and mechanical properties compared to CNT, while its thermal/chemical stabilities, biocompatibility, electric insulating, and thermal neutron absorbing properties are much higher than those of CNT. Due to these superior properties, BNNT is currently under exploration in many areas of IT, space/nuclear, bio-medical, and energy. Thermal Stability Stable in highly oxidizing (or corrosive) environments, e.g. ~900 °C in air. Kilgram price quotes available by request. Additional discounts also available for large volume orders. For more information contact our Sales Manager at sales@nanointegris.com or call +1 -866-650-0482.